I'm in the midst of another adventure - this one a road trip with 4 teens. The past couple of days I've been glued to the steering wheel. Mile after mile after mile. 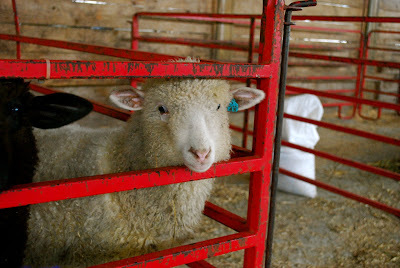 I've missed my knitting time, but it's been a good opportunity to chat it up with the kids. Teenagers often have a fresh outlook on things, and I appreciate their perspective. And their sense of humor can be entertaining at times. Don't get me wrong. Being cooped up with them for hours on end has had it's moments, but for the most part it's been enjoyable. The roadside signs for Kent State University prompted a discussion about the Vietnam War and the student protests. It was a good discussion for teens on the brink of adulthood. Driving can be a good opportunity to ponder and reflect. The conversation made me pause and wonder whether we learned anything from those events in our history. Cross country road trips like this make me want to meander off the main road and explore the back roads the way Charles Kuralt did. 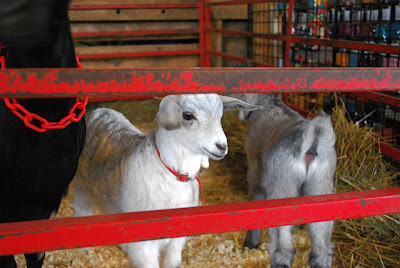 For example the signs in Ohio for Grandpa's Cheesebarn caught our attention. We were tempted to take the exit, but with almost 1000 miles to travel and time constraints our focus was on our destination. Now that we've arrived the kids are doing their thing, and I have time to myself. I have a lot of computer work to catch up on, but after all that driving I've earned knitting time. I have several projects traveling with me - plenty to keep me occupied during my downtime here. The first project to get my attention was Embossed Leaves. This sock is almost back to where it was at before I ripped it out, and I'm pleased with the results. My reward for 2 days of driving is uninterrupted knitting time with an audio book. If I'm feeling really adventurous, I may even scope out a yarn store or two. Lately I've been experimenting with yellow and color combinations that include yellow. 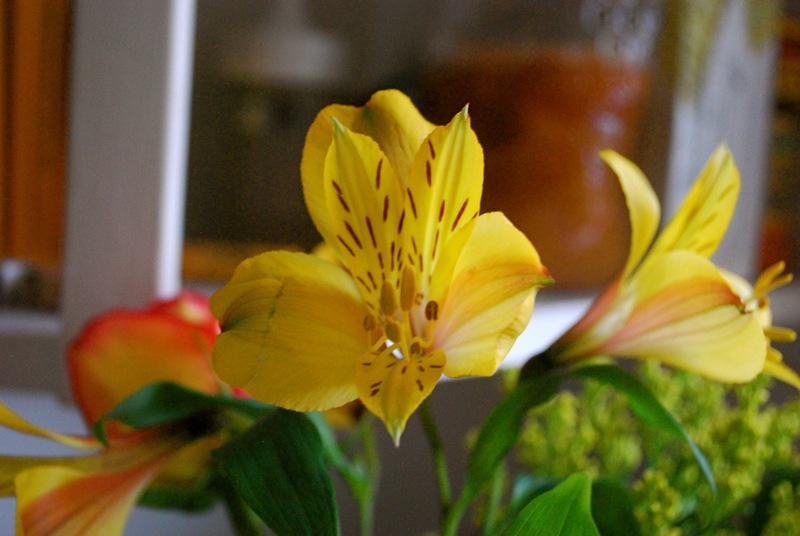 I was gifted with flowers this past week and of course my eye was drawn to the yellow - my color inspiration for the week. Life is full of contradictions, and I was recently reminded of this. On one hand I have access to a range of electronics - from the phone to the computer to the printer. If all these electronic devices are working, they make my life easier. I can do more work in less time. And because they are portable and I'm always in communication, I can work on-the-go. There's no excuse for not getting work done. I can work anywhere; I can work all the time. Sort of a mixed blessing. In reality these gadgets aren't always working. I get bogged down with updates, backups and trying to stay current. Downtime can be frustrating. There's work that needs to be done, but instead I have to spend time figuring out system requirements and software. And please don't let me lose any data along the way. It's interesting that the technology that makes my work efficient can, at times, be the source of inefficiency. 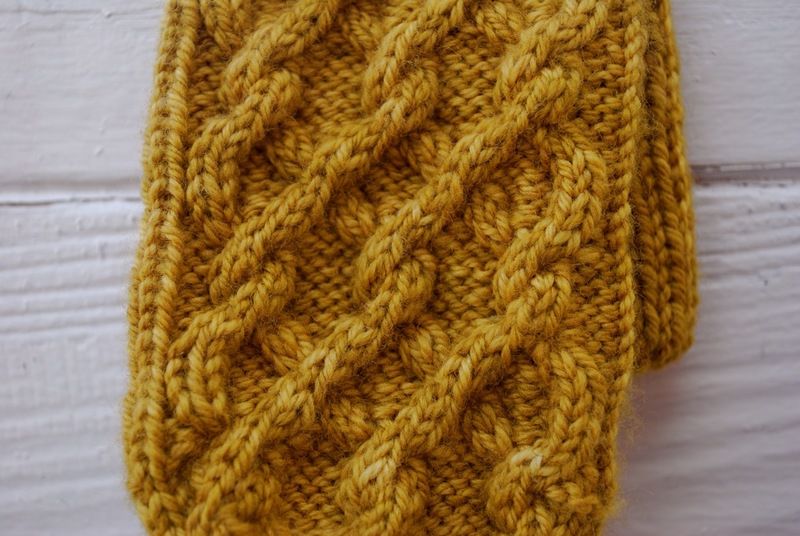 On the other hand I spend endless hours knitting socks, sweaters, shawls and mittens one stitch at a time. It's a slow process when you think about it - stitch after stitch after stitch. Some projects are weeks or months in the making. Some take even longer than that. But it doesn't matter. 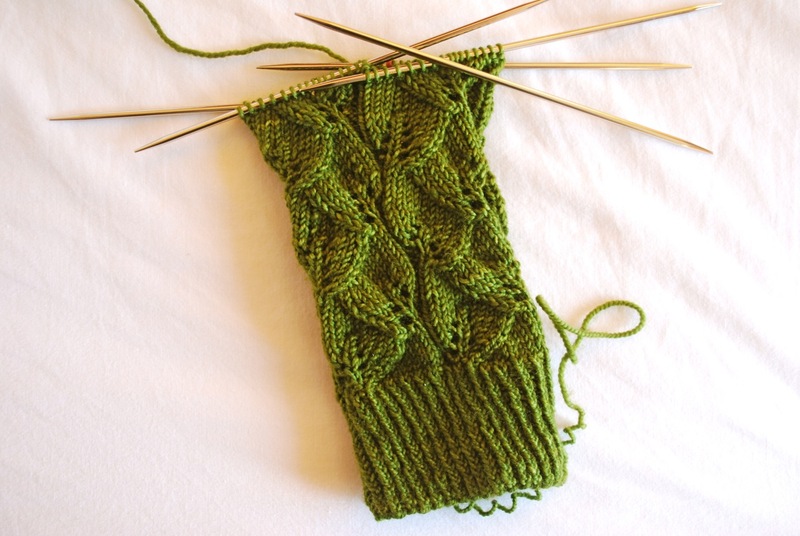 When it comes to knitting a project, I don't expect to crank it out in a few hours. I'm in it for the long haul. 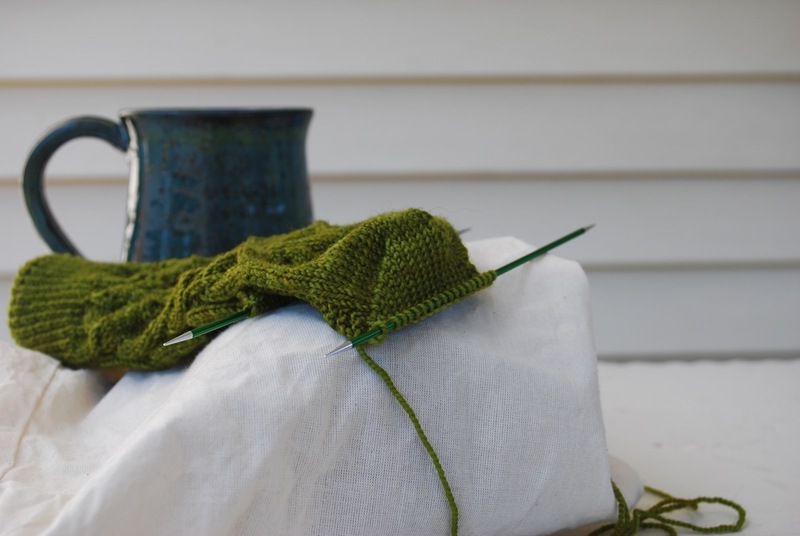 The dynamic, rapid pace of technology versus the slow, steady process of knitting. Over the last few days technology has taught me more than I ever thought I'd need to know about external hard drives, operating systems, syncing and cloud storage. And in the process I was reminded that the age-old craft of knitting is the perfect balance to the fast, ever-changing world of electronics. After my latest run-in with technology, I need some balance. We've had an aggressive summer cold making the rounds at my house. The symptoms include watery eyes, continuous sniffling and extended fits of sneezing. By extended fits of sneezing I mean sneezing 10 - 12 times in a row. Sneezing so hard it feels like your eyes are going to pop out. Once this cold grabs you, you must have a box of kleenex in your possession at all times. No one in the house has escaped this cold. Last week when I had a sore throat that came and went, I thought maybe that was it for me. After waiting on all the sick ones in the house, maybe my reward was just a minor irritation. That was not to be the case. Yesterday I felt the full force of this nasty, uninvited guest. I awoke to several rounds of serious sneezing but was determined to make the most of it. I would put my feet up, knit to my heart's content and ride out this crazy cold. I was going to make lemonade out of lemons. And I did . . . to some extent. 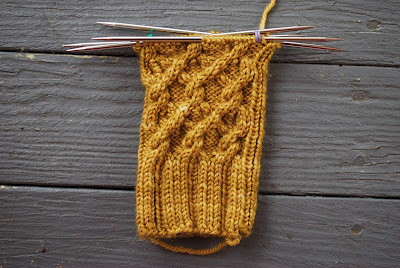 When I wasn't sneezing, blowing or dozing, I worked on a sock in progress. This is Embossed Leaves with the heel turned. It was shortly after this that I realized I didn't like the way the sock fit. 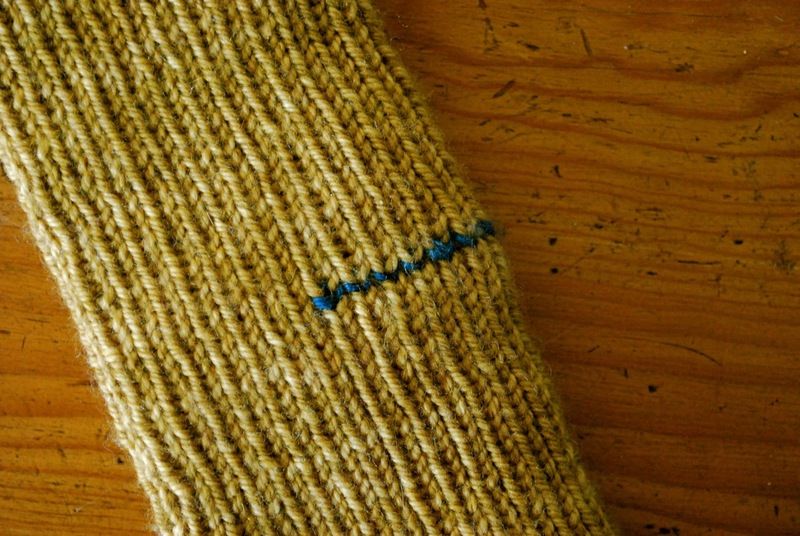 I love these socks and I've made the pattern before, but something wasn't right. 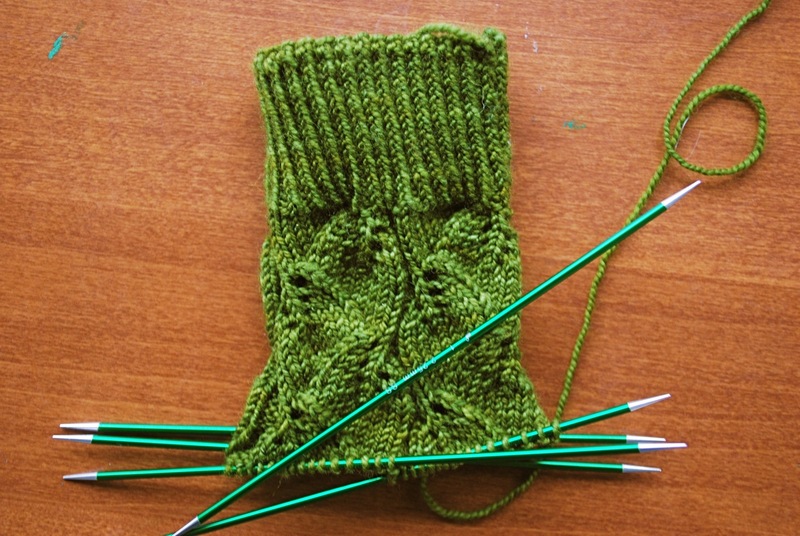 I'm annoyed with myself that I waited to turn the heel before admitting this. 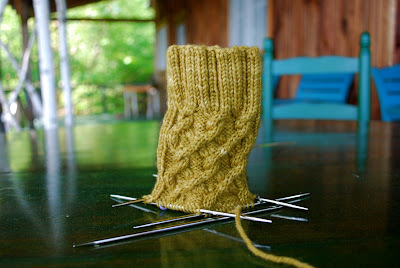 On the other hand I'm proud of myself that I didn't confront the issue after I had knit the toe. The sock has already been ripped out, and I have a new strategy. I didn't have the heart to start over yesterday, but I will be casting on again today. I'm not abandoning the project. 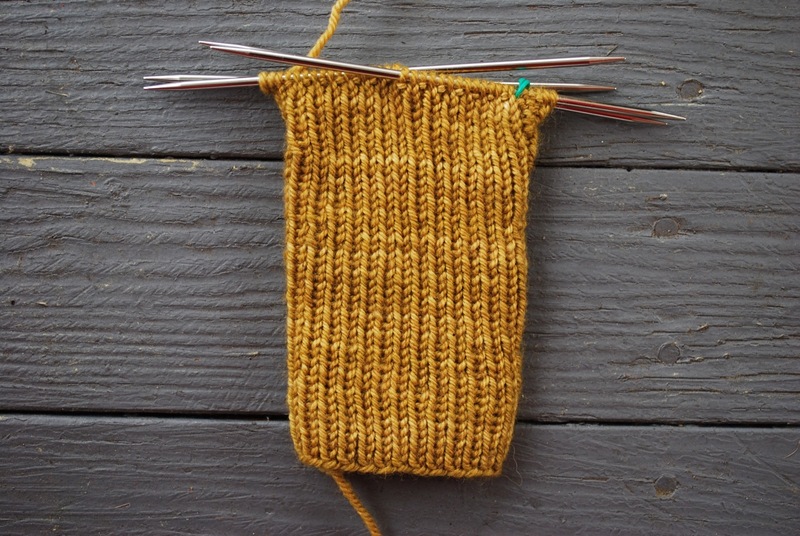 When one project hits the skids, it's often helpful to cast on something new right away. It helps keep morale up. In between sneezing and dozing I worked on this. 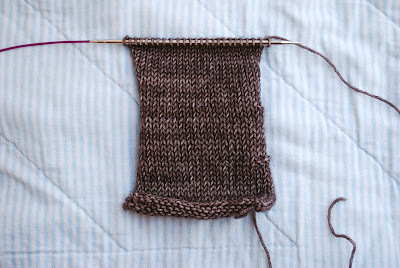 It may not look like much, but let me just point out that there are many stitches on fairly small needles - one row takes a lot of time. This was the best medicine. There's nothing like a new project to lift my spirits. This week we observed the summer solstice and the longest day of the year. Not that the day is actually any longer - it's the hours of daylight that we celebrate. I marked the occasion by trying to stay cool. We're in the midst of a heat wave here where any beverage on ice is a valued commodity and even the grocery store is selling air conditioners. The temps have been well into the 90s, but that hasn't stopped me. I've been knitting away, always within striking distance of a fan. Lucky for me I've had something small and portable to work on. An afghan or sweater would have been more challenging. 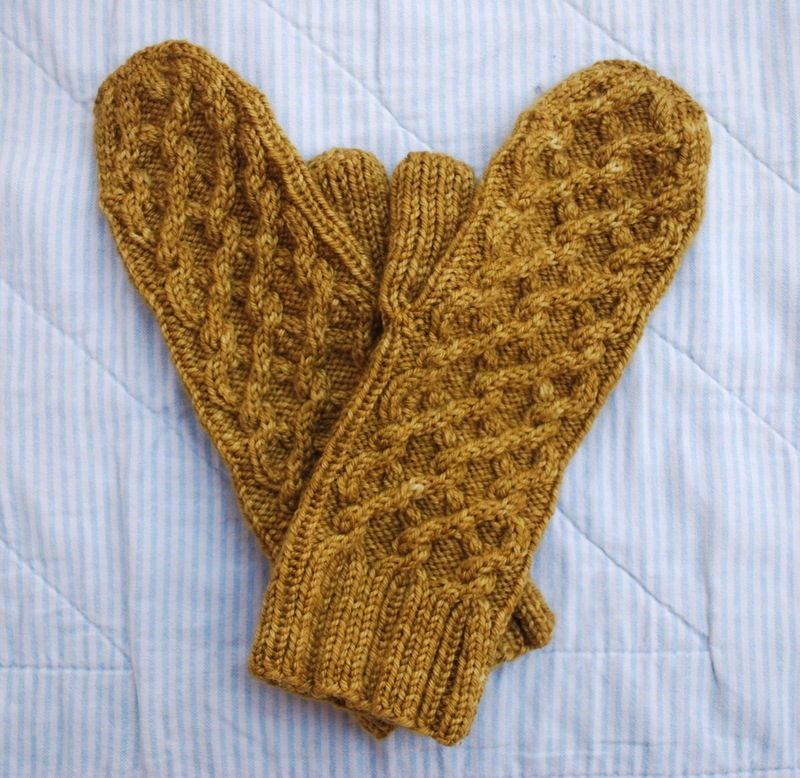 With their golden color these mittens are like a bit of sunshine. The yarn is Dirty Water DyeWorks Edna, colorway Dijon. 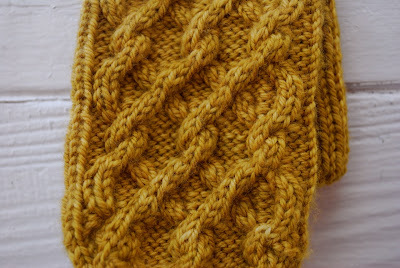 The ribbed cuff flows into the cables. The twists and turns create a pattern with texture and depth. The design has a ribbed palm and thumb that stretches enough to accommodate most hand sizes. These mittens are truly one size fits most. I hated to see this project come to an end. What's even worse is that I have to pack the mittens away. The only consolation is that I'm replenishing my supply of handwear long before I need it. I'll pull these out when the weather shifts and the daylight hours become shorter. And I'll be reminded of the summer sun. 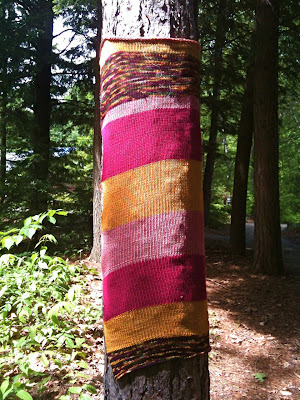 For those who are interested, the Rhinebeck KAL theme continues with Rhinebeck Socks. Follow the link for a preview picture. The first clue will be released tomorrow. 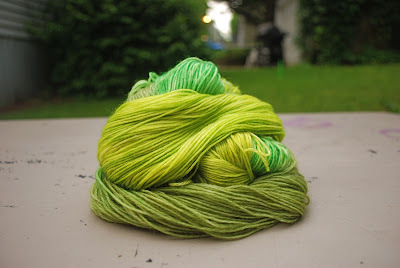 This week I dyed yarn for a couple of special requests - colorways that were similar yet different. Together they are my color inspiration for the week. I have a new project idea that's been percolating for quite a while. Since my travel schedule isn't quite as hectic as it was, I decided that now would be a good time to move this project off the back burner. Once I make the decision to start a new project, I want to start it now. This project is a bit more involved because I have to dye the yarn first. That's not really an issue - just a slight detour in starting now. 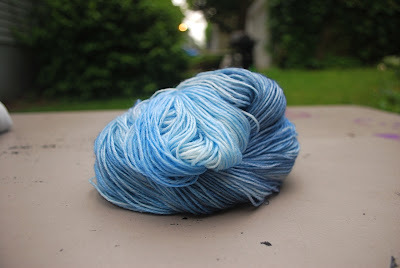 I dye yarn every day, so one more pot isn't going to make a difference. Then I started thinking this through, and it's the thinking that caused the delay. This project uses 3 different needle sizes. I'm not using the suggested yarn, but I am using a yarn that's close . . . sort of. 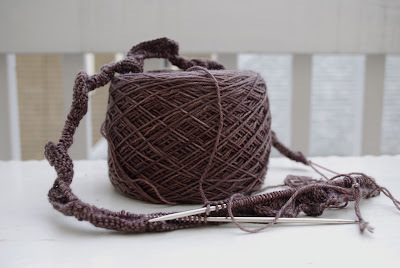 Different size needles, different yarn - what if the yarn doesn't work for this project? I have a vision of how this project is going to work up. What if it flops because I'm using the wrong yarn? After thinking a bit more I came up with a logical, obvious solution. Swatch before I dye the yarn. I had an odd ball of this yarn taking up space on my desk and cast on for a quick swatch. 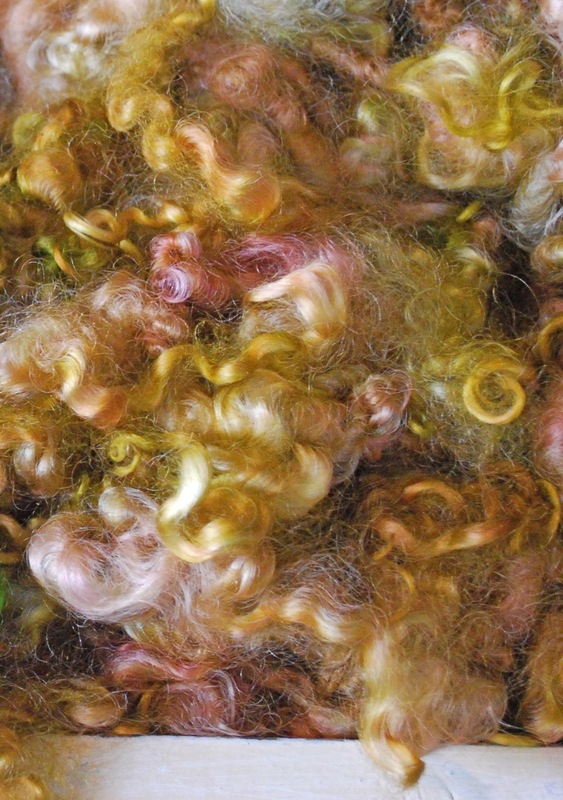 If the yarn wasn't going to work, I could save myself the trouble of dyeing it and start searching for a substitute. Now I'm ready to move forward with this project. 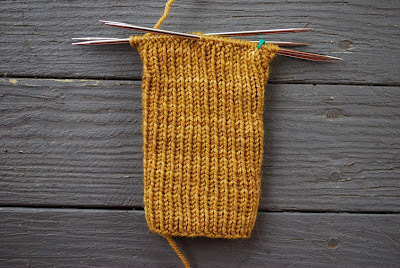 I swatched with 4 needle sizes, and this yarn is working up just as I had envisioned. Next up . . . the dye pot. 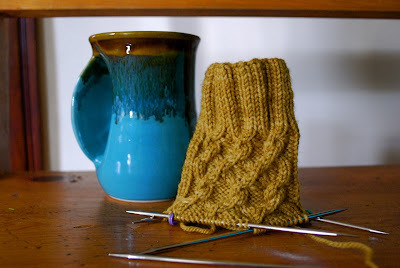 I'm still enamored of the Rhinebeck Mitten KAL (Ravelry link). 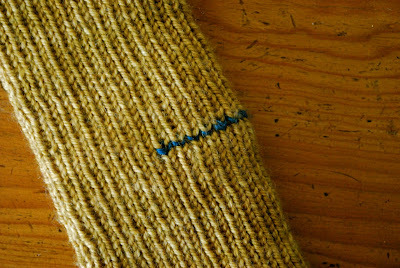 The blue strand of yarn will be removed to make way for the thumb. I've thoroughly enjoyed this KAL with pattern clues released at regular intervals. This project has given me a sense of order in the midst of chaos. Up until now I had a comfortable rhythm with this project. When a clue was released, I would work it immediately and then pick up another project while I waited for the next clue. It was like homework, except I was caught up. The most recent clue was released just the other day. 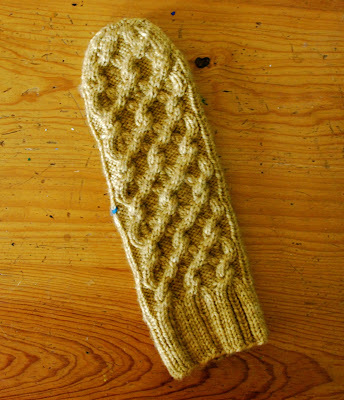 I got on it and finished the top of the mitten in no time. All that's left is the thumb, but I'm waiting on the clue. Instead of turning to another project while I wait, I decided to keep the momentum of this one going. The second mitten is well on its way. I'm about to add a strand of waste yarn for the left hand thumb. 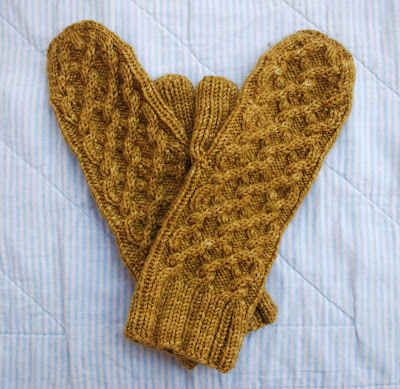 With any luck these two mittens will be finished at about the same time, and I will have avoided second mitten syndrome. In other news . . . the website has been updated to include a couple of new kits - Brooklet Scarf Kit and wee Austin Hoodie Kit. You'll have to scroll down to the bottom of the page to view the wee Austin. And Lillian has been updated with some new colors - Desert Rose, Gooseberry and Wheat. These colors debuted this spring, and I finally posted them to the website. 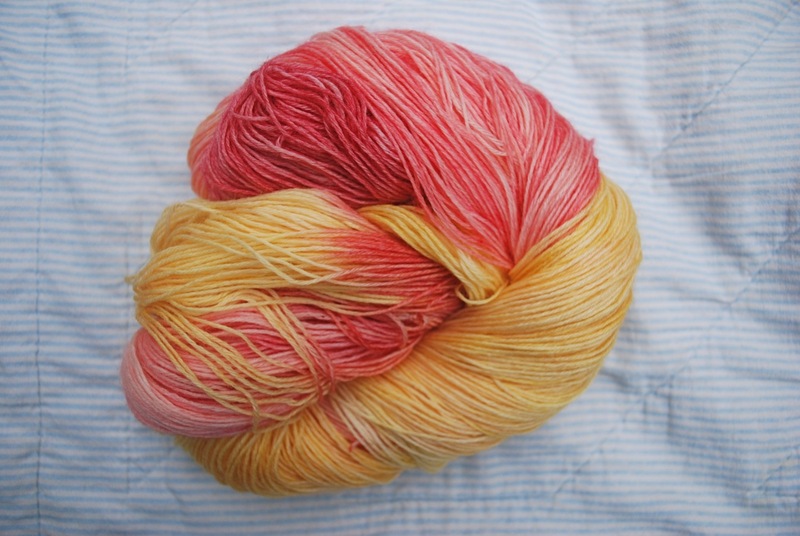 Take a peek at this Catkin (Ravelry link) to see Desert Rose and Gooseberry in action. That's enough news for one day. I have a mitten that needs my attention. I know it's not officially summer yet, but it seems that many people have made the transition to the season of shorts, flip flops and days at the beach. Vacations, long weekends, a more relaxed pace. I'm usually slow to shift gears and find myself in mid-August trying to cram all the summertime activities into two weeks. This year I'm trying to do better. For starters I'm going to savor my first coffee of the day outside on the porch. Weather permitting, of course. While I'm sipping that coffee, I might as well knit a few rounds. Usually I grab my first cup and get busy, but the work can wait a few minutes. 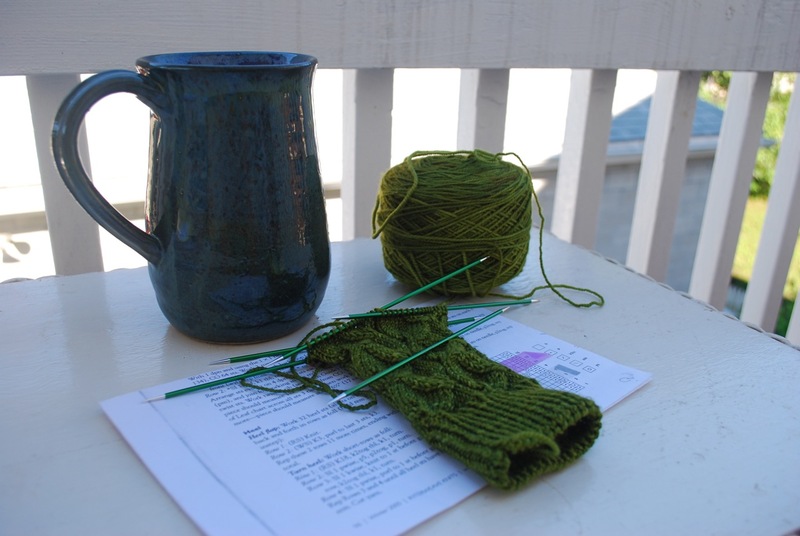 Coffee and knitting - I think I'm going to enjoy easing into my day. At this rate a day at the beach can't be too far away. 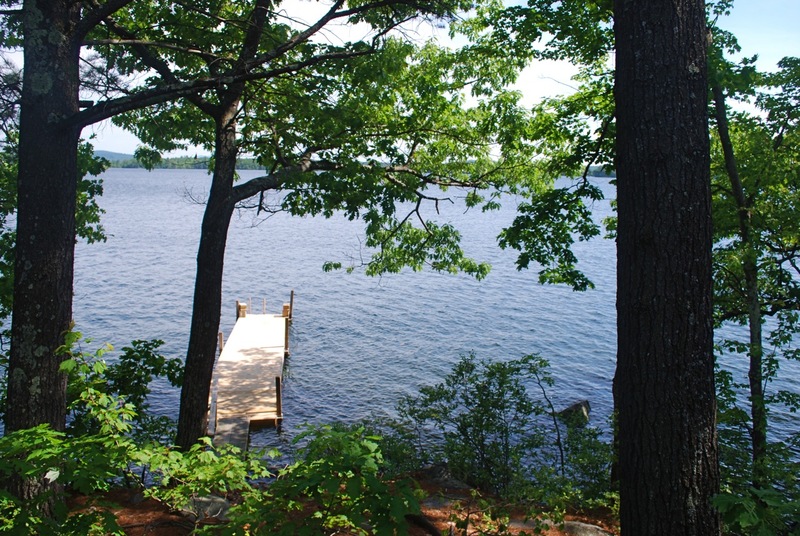 My color inspiration for the week comes from the shores of Squam Lake. I've been stuck on green for a while now, but something about the fresh green along the water's edge spoke to me. 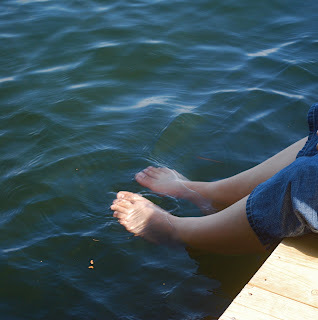 The cool breeze, the dancing sunshine, the gentle waves . . . magical. I've been working diligently on my Rhinebeck Mitten. If the day weren't so dark and dreary, I'd have a picture to share with you. The mitten traveled with me to Fiber Frolic and Squam. It's been my on-the-go companion, but now I'm stuck. I'm caught up with all the clues and am waiting for the next one to be released. While I wait, I've been working on another portable project. Embossed Leaves in Dirty Water DyeWorks Lillian. There's nothing like a sock to take the edge off waiting. After a delightful Saturday at Squam Lake and Squam Art Workshops, Monday morning is challenging. The lake, the trees, the peace and quiet are but a distant memory. SAW is held at Rockywold-Deephaven Camps, a retreat center that was founded in the late 1800s. Today the center includes numerous pine buildings and cabins situated in the woods along the lake. The center is a model in self-sufficiency. Every winter they harvest ice from the lake to use for refrigeration during the summer months. We had beautiful weather on Saturday and just enough time to enjoy our surroundings before the Spring Art Fair in the evening. 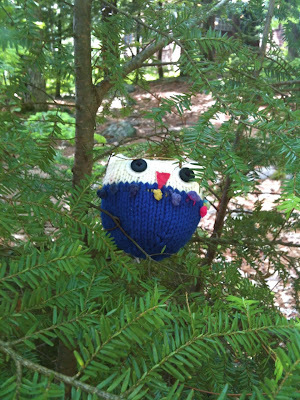 As we made our way through the woods there was evidence of knitters everywhere. 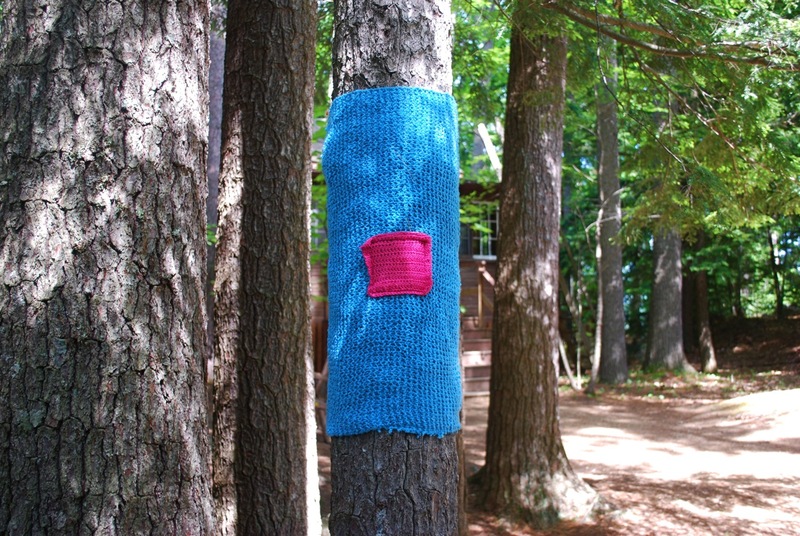 Yarn bombing must have been a popular retreat activity. 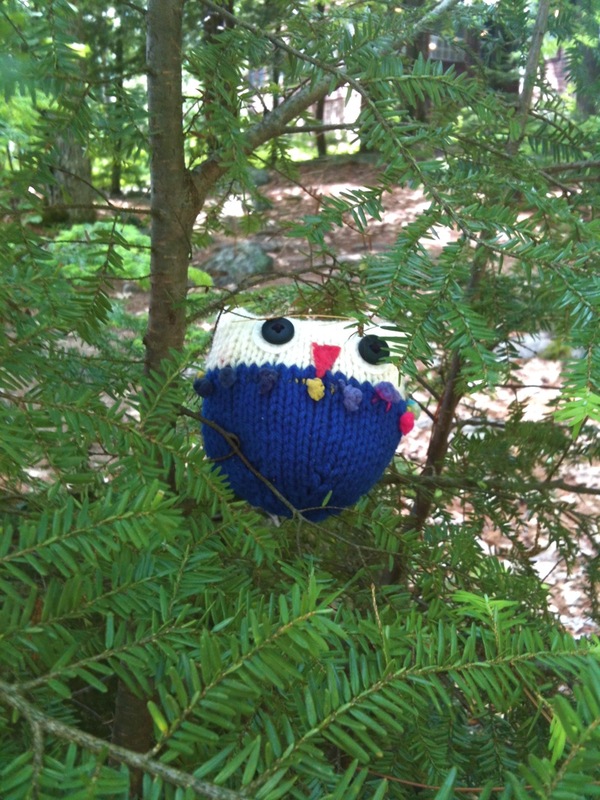 This little one was hiding in the trees - a fun splash of color. I took a few minutes to sit on the Long House porch and admire the view. 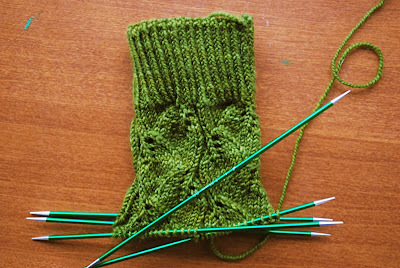 Just enough time for a few rounds of mitten knitting. Just enough time to get our feet wet. I could have lingered longer at the lake, but it was time to set up for the evening event. The Art Fair was bustling with activity. It was fun to meet so many enthusiastic retreat attendees. In the blink of an eye it was over. We made our way out of the woods, away from the lake, leaving the peace and tranquility behind. Added: Thanks to an astute follower I was notified that the website is down. I have someone working on it, and the site will be up and running in a day or so. 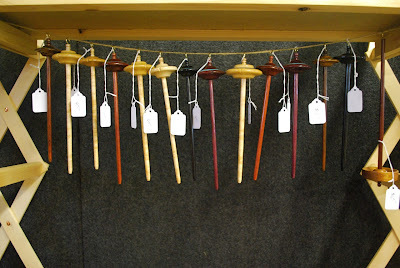 If you have a yarn emergency, leave a comment or send me an email at dirtywaterdyeworksATgmailDOTcom (replace the AT with @ and the DOT with .). Yes, it's a Monday. Today's post is a public service announcement. Tomorrow marks World Wide Knit In Public Day. 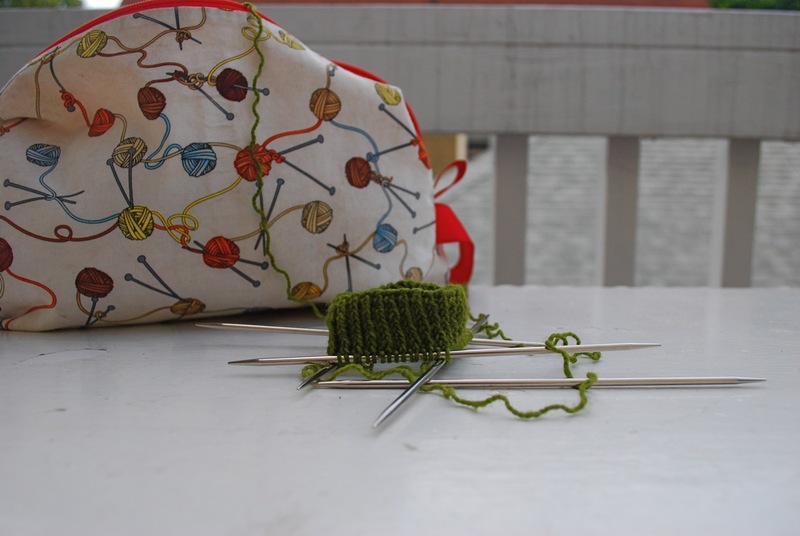 This year the Knit In Public events span a little more than a week, not just a single day. Check the website for an event in your area. And remember any day is a good day to knit in public. 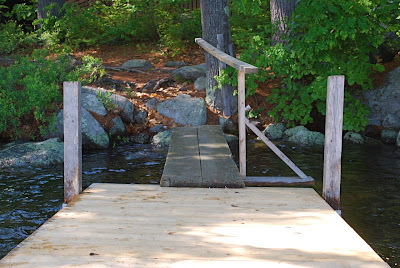 Tomorrow I'll be on the road to Squam. Since I'm the driver, my knitting time is limited. I've vowed to knit at least a couple rows in public - maybe at a rest area between here and there. I spotted this last weekend at Fiber Frolic - my color inspiration for the week. I'm gearing up for one last road trip this weekend before I shift gears for the summer. 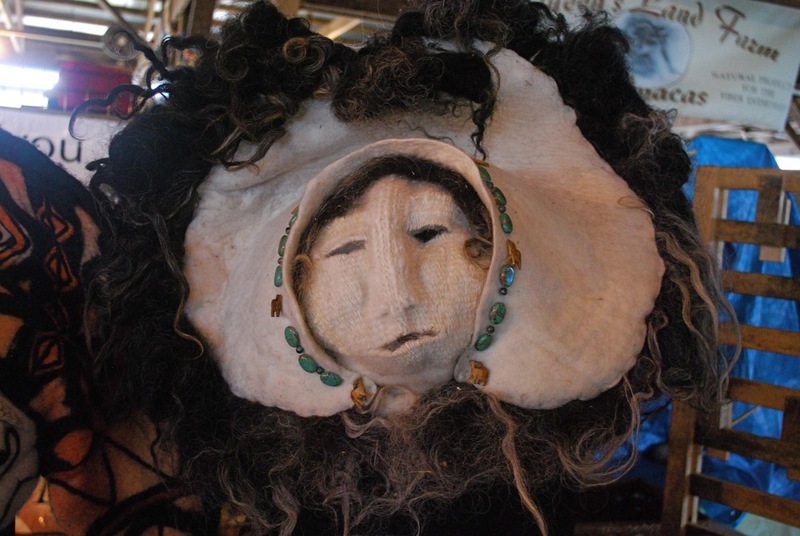 This week there's a bit of magic going on in New Hampshire at the Squam Art Workshops - a retreat to foster creativity in a relaxed, peaceful setting. I would love to be on retreat, but instead I'll be working as a vendor at the Art Fair on Saturday evening. The retreat sessions are all booked, but the Art Fair is open to the public. If you're in the area, consider a trip to Holderness for an evening full of inspiration and creativity. See the link for more details. 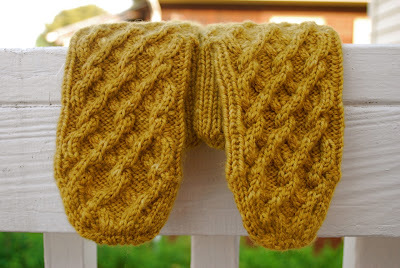 Knitting time has been in short supply, but I've been working diligently on my Rhinebeck Mittens (Ravelry link). Every few days a new clue is released. I fell a bit behind last weekend when I was on the road, but I'm working on the current clue now. It's kind of like homework - fun homework. 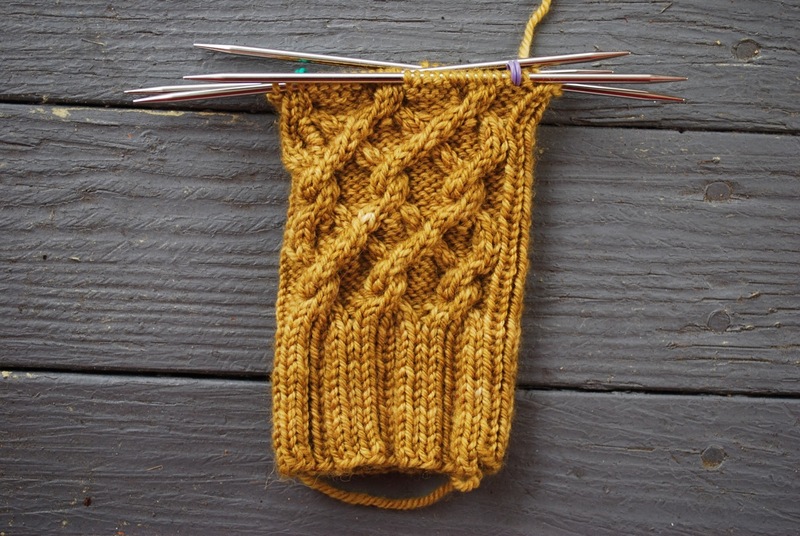 The 1x1 ribbing is stretchy and guarantees that this mitten will fit almost any hand. The project knits up quickly and is very portable. Follow the link to join in the fun. I'm in a fog this Monday morning, recovering from Fiber Frolic. It was a fun weekend on many levels. The weekend in pictures . . .
A baby cashmere goat from Black Locust Farm. If only they would stay this little. 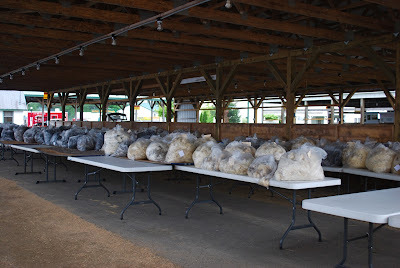 Bags and bags of fleece. 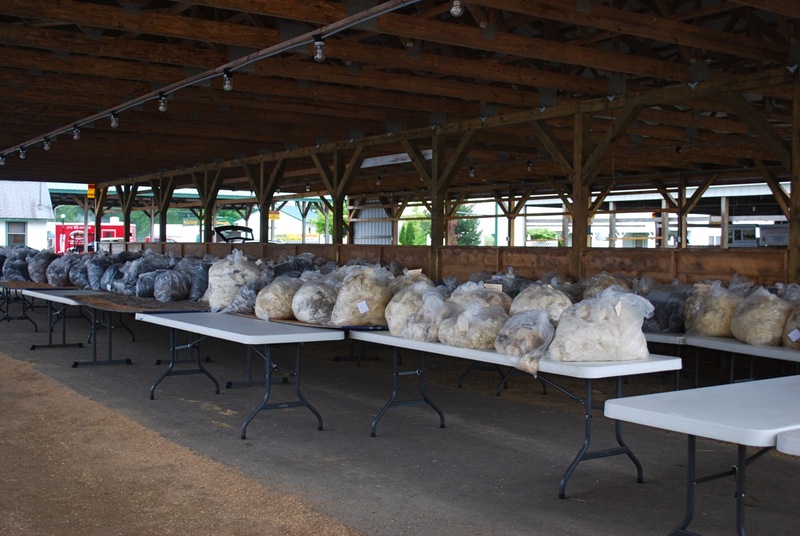 Fiber Frolic features a diverse selection of vendors. Susan from Weaving a Life had stunning woven masks. 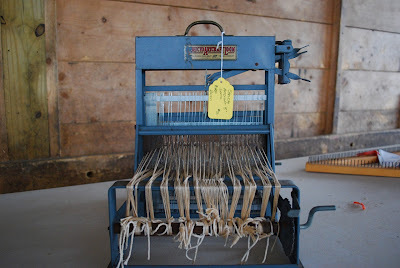 Follow the link to read more about her work and her weaving. 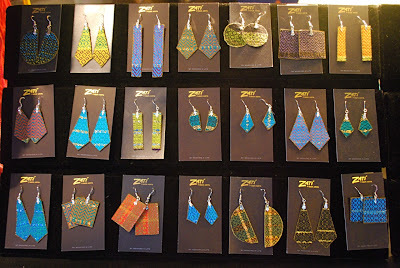 Woven earrings also made by Susan. 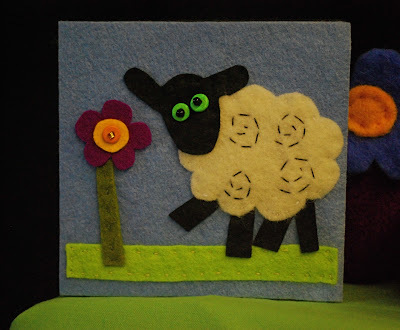 Whimsical sheep from Designs by Lynn Holaday. Spindles from Autumn Hollow Farm. There were goodies in the used equipment barn. This loom looked like it came out of grandma's attic. 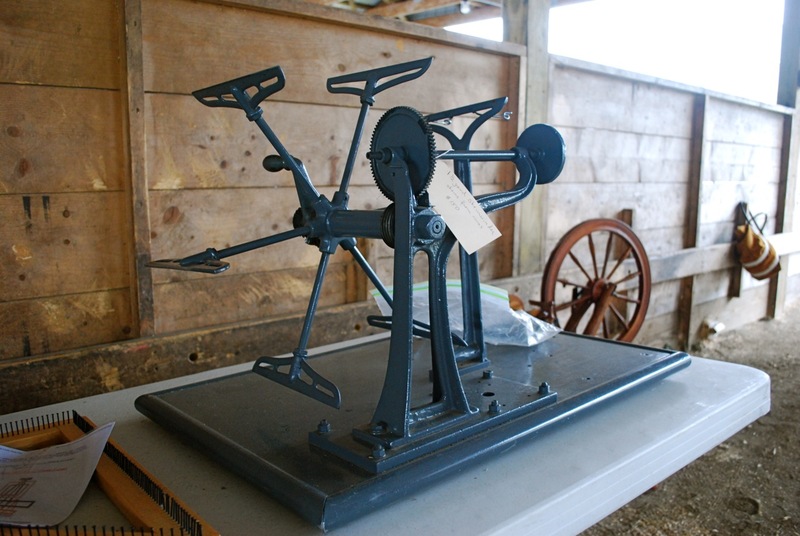 And this hand crank skein winder would give you a workout. Half the fun of these events is meeting new and interesting people. Cindy and Katie from primitive stuff attracted a lot of people with their looms. They were giving demonstrations all weekend long. I had an interesting discussion with Pete Feeney on buying local and sustainable living. Pete is with The Long Branch School and General Store. They work to promote local businesses and self-sufficient skills through classes and a storefront. 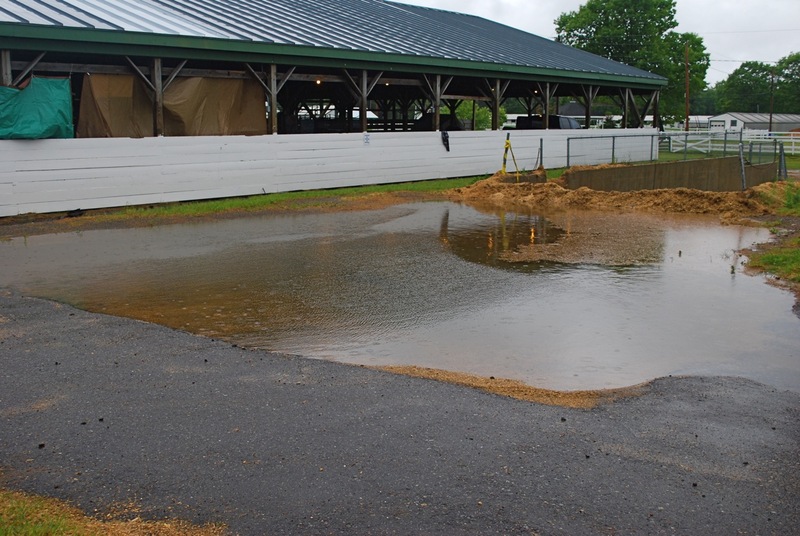 The rainy weather held off until Sunday when we had a good dose of raw, wet New England weather. 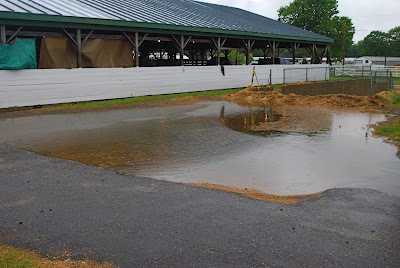 There was enough rain to form a small lake by the barns. And now it's Monday. It's great to start a new week after a weekend full of fun and inspiration. One of the most important life skills is the ability to roll with the punches. I'm dealing with an extra layer of chaos these days. As a way of coping I decided to play with colors. I've found a bit of colorful distraction can work wonders. As an aside one of the synonyms for chaos is holy mess. I'm going to have to start using that. Word play is also a good distraction. 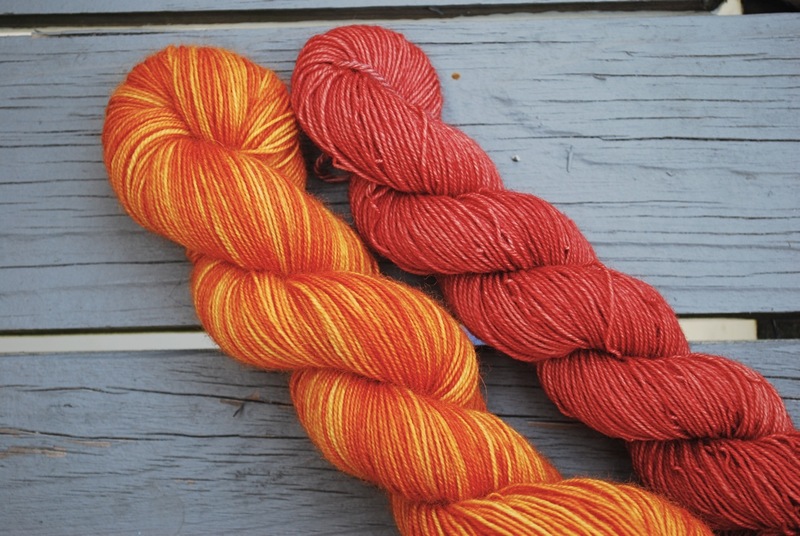 To brighten up my day I brewed up some Potluck colorways. These are one of a kind colorways. With Potluck the emphasis is on color play. I'm not worried about reproducing these colorways, so it's all for fun. These three and several more will be making the trip to Maine this weekend. 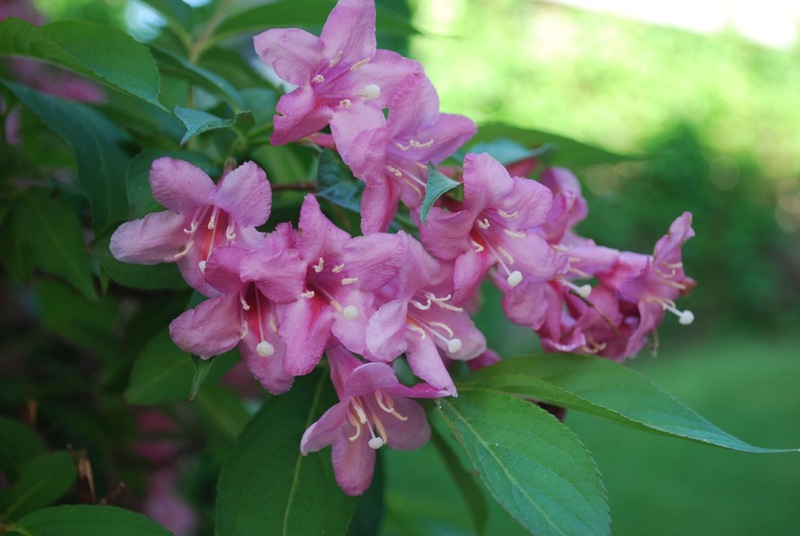 My color inspiration for the week is a secondary color. These pink blossoms are stunning, but I was attracted to the centers.